Who’s ready for a top tier dinner idea the whole family will love?! 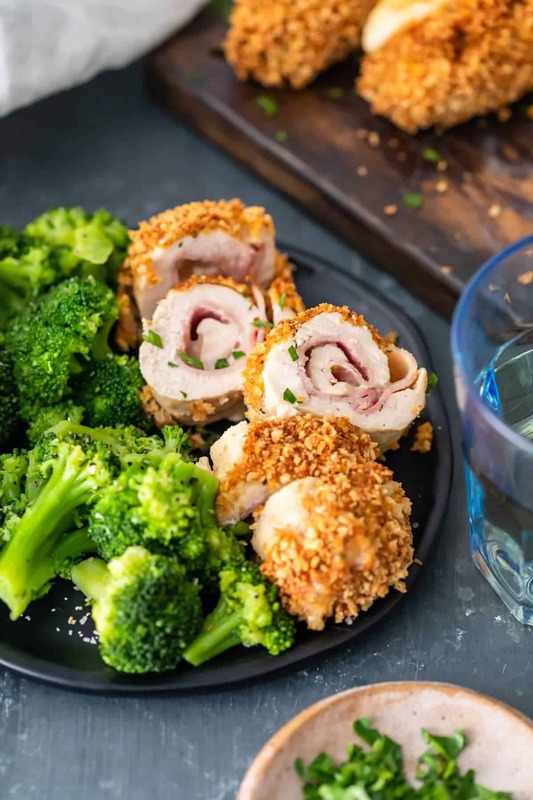 If you said yes to the question above, then stop what you’re doing right now, and grab what you need to make this crazy delicious chicken cordon bleu!. 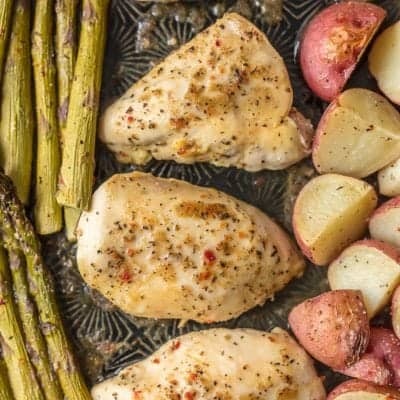 Not only will this easy chicken recipe make everyone come running for dinner, but it will also leave them wanting seconds or even thirds. Everything about the recipe is drool-worthy. From the rich ham rolled inside a juicy chicken breast, with an amazing swiss cheese middle, there is no going wrong! 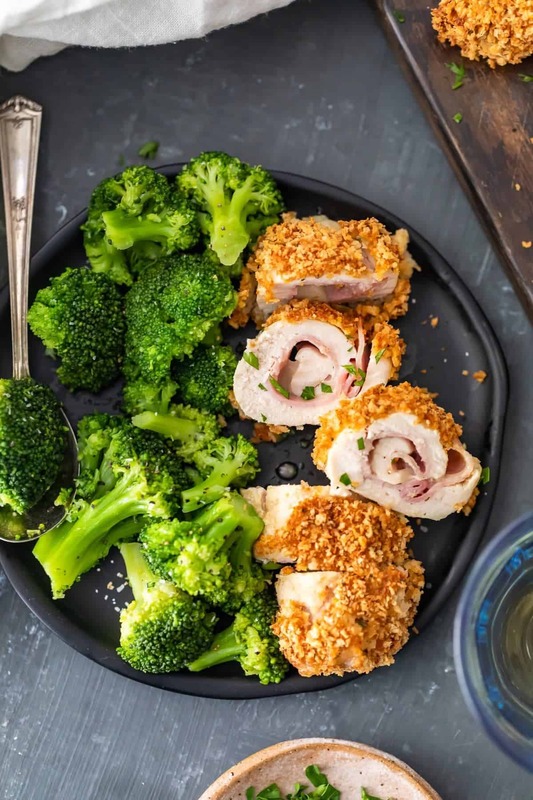 While I love all parts of chicken cordon bleu, I’ll have to say, the dijon cream sauce is what really makes this classic into a weeknight dinner you won’t want to pass up on. What Is Chicken Cordon Bleu? You might be wondering why this dish has its strange name that doesn’t really explain what the dish is at all. 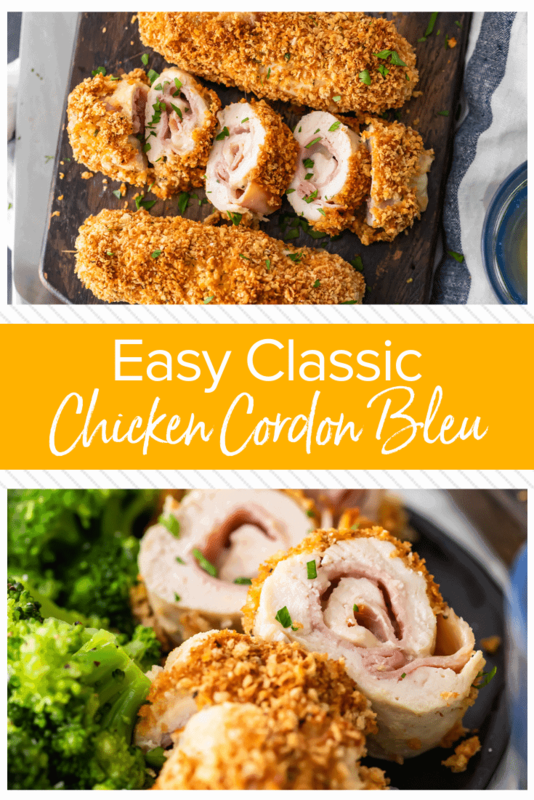 Well, the name cordon bleu actually goes back to medieval times in France where the term was given to a special order of Knights. The term translated to “blue ribbon” meaning those knights were the highest order. So, I’m sure you can infer from here that chicken cordon bleu got its name, as it became known as the “blue ribbon” of dishes. 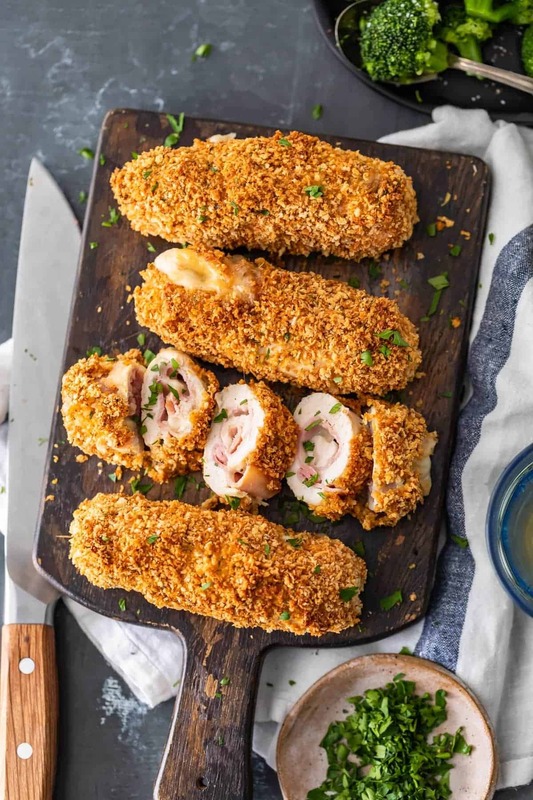 The dish typically consists of breaded chicken breasts pounded thin, stuffed with a slice of ham and a slice of Swiss cheese. It can be baked or fried and often has a creamy sauce poured over it. Don’t let the detailed directions or fancy name deter you from trying out this recipe! It’s still pretty simple and can be made in under an hour. Just start by preparing the rolled chicken according to the directions and refrigerate for 1-2 hours. Then preheat the oven and roast the breadcrumbs until golden brown. Remove from the oven and pour the breadcrumbs onto a small plate to cool. Remove the chicken from the refrigerator and unroll the breasts. Season each with kosher salt, black pepper, and Herbes de Provence. Next, In a small bowl, whisk together the Dijon mustard and mayonnaise, and brush a thin layer of the mixture over each breast. Place the eggs in a bowl and whisk lightly. Roll and gently press a chicken breast in the panko breadcrumbs, then dip and roll the breast in the beaten eggs. Place the breaded breast on the baking sheet and place in the oven. Cook until the chicken is golden brown and the internal temperature registers 160°F on a meat thermometer. Serve with the Dijon Wine Cream Sauce and… Enjoy! To ease some of the pain and confusion, here are a few of my favorite pro tips for prepping chicken. Use fresh meat if possible: I love using frozen chicken, and its a great way to save a little money, and to be able to buy meat in bulk, but I will say, if you really want the best quality, and juiciness, it’s best to use fresh meat that’s never been frozen. Even out the chicken: For even cooking, you’ll want to pound the meat until it’s a uniform thickness. To do that just Lay a chicken breast between 2 pieces of plastic wrap and use a meat mallet to pound the chicken to ¼” thickness. Be careful not to pound any holes in the chicken. Don’t cross-contaminate: Raw chicken can easily contaminate other food and kitchen tools if you aren’t careful. To avoid any contamination, be sure to put any tools used on the raw chicken right into the dishwasher, or into a sink full of very hot water and soap. Also be sure to thoroughly wash your hands after coming into contact with any of the meat, or juice. 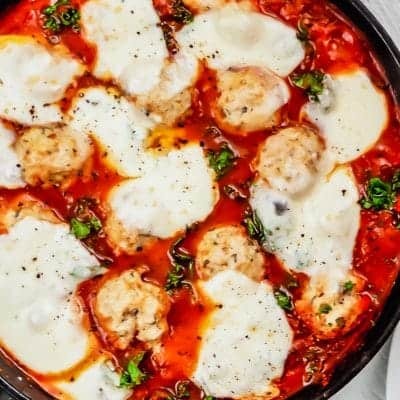 What Tools Will I Need to Make This Recipe? We all love the ease and simplicity of a recipe card, with the clean separation between what ingredients you’ll need, and what you’ll need to do. Sometimes though, that isn’t quite enough. There’s nothing worse than going out and buying all the ingredients for a recipe to them come home and realize you don’t have all the baking tools the recipe requires. 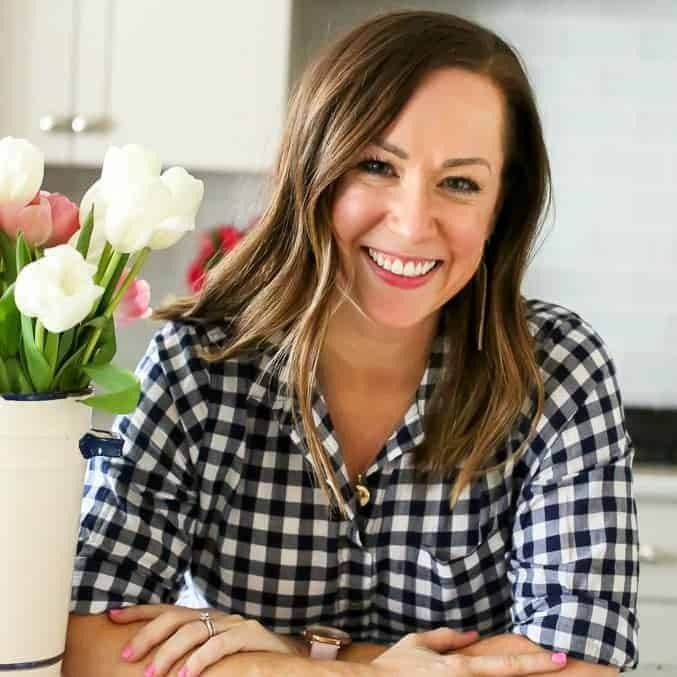 I have definitely felt that pain before, so to make sure you really have everything you need, be sure to check out this list of just a few simple kitchen tools you’ll want to have on hand. To find the full ingredient list and directions, scroll to the bottom for the printable recipe card. 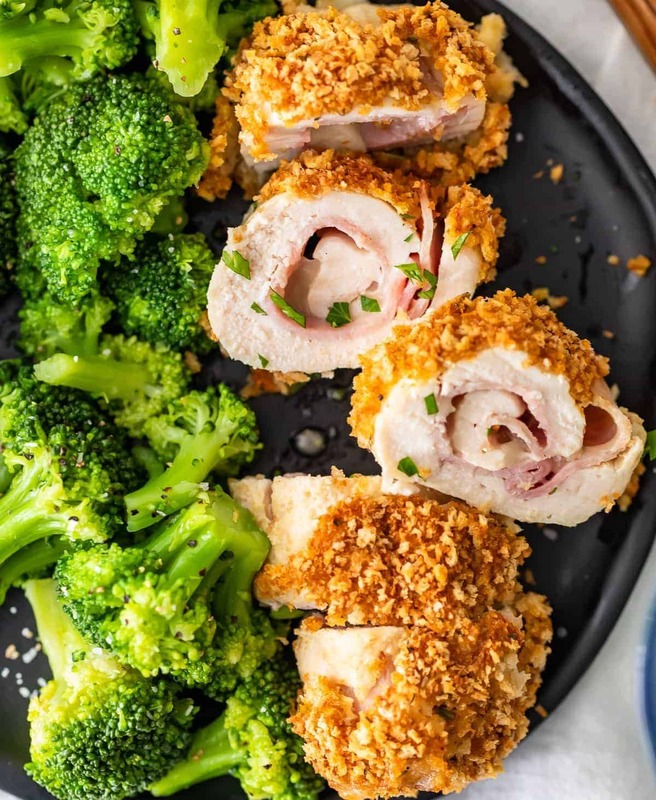 With a dish as versatile as an easy chicken cordon bleu recipe, there are plenty of ways to serve it. One way is to serve it up alongside a few side dishes like Siriacha Honey Roasted Broccoli, Avocado Caprese Salad, and the Best Twice Baked Potatoes, for a casual weeknight dinner. Another one of my favorite ways to serve this is as a fun and sophisticated appetizer at a dinner party. To make this into a quick appetizer, just prep the chicken as normal, and before serving, cut each breast into small slices. Pair it with a few other great dinner party staples like a Ginger Whiskey Cocktail, and Spinach Artichoke Dip. 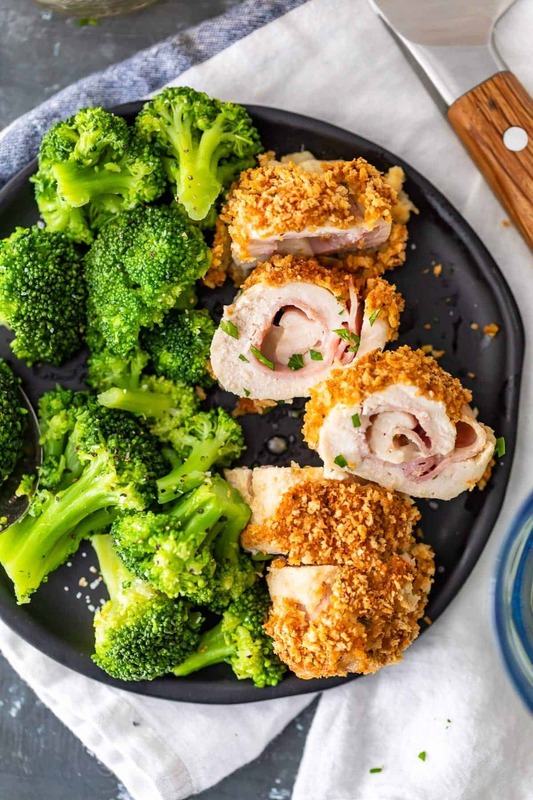 This chicken cordon bleu recipe if ideal for nights when you want to feel like you’re really getting that “blue ribbon” quality dinner. 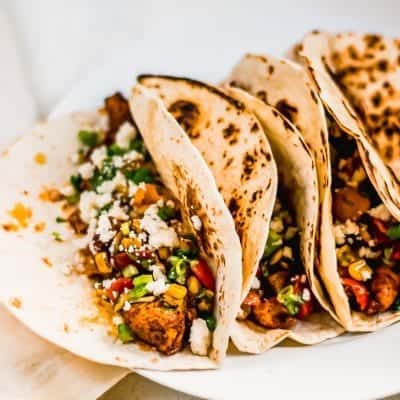 With a dish this flavorful, it will be a dinner no one can stop talking about! You won’t want to miss out on this one! For all of your other easy dinner needs be sure to check out even more of family-friendly chicken recipes! Here are a few that would be perfect to add to your dinner menu this week! I can’t wait for you to try out the new recipe and hear all about what you think! Be sure to leave a comment below once you’ve given it a try! Lay a chicken breast between 2 pieces of plastic wrap and use a meat mallet to pound the chicken to ¼” thickness. Be careful not to pound any holes in the chicken. Remove the top layer of plastic wrap. Place one slice of ham and 1 slice of cheese over the pounded breast. Fold over the sides of the breast to make more of a square (it won’t be a perfect square). To roll and wrap the breast, pull up gently on the bottom sheet of the plastic wrap while rolling the breast into a tube-shape. Roll the breast tightly. Now, pick up both side ends of the plastic wrap and carefully spin the breast to tighten each end (as if making sausage links). Fold the twisted ends of the plastic wrap underneath the breast and place it is a dish with the folded plastic ends underneath. This method closes each end of the breast and holds the ham and cheese in place. Repeat with the remaining breasts. Refrigerate the breasts at least 1 hour or up to 2 days ahead. Thirty minutes before cooking, remove the breast from the fridge and heat the oven to 375°F. Set the oven rack to middle position. Cover a sheet pan with foil and pour the panko breadcrumbs evenly over the foil. Roast the breadcrumbs 5-6 minutes or until golden brown. Shake the pan halfway through browning. Remove from the oven and pour the breadcrumbs onto a small plate to cool. Place a metal rack over the same foil-lined sheet pan and spray the rack with nonstick cooking spray (the chicken breast will be placed on this while the chicken cooks). Unroll the breasts and season each with kosher salt, black pepper and Herbes de Provence. brush a thin layer of the mixture over each breast. Place the eggs in a bowl and whisk lightly. Place the breadcrumbs and the eggs next to each other on the work surface next to the foil-lined sheet pan. 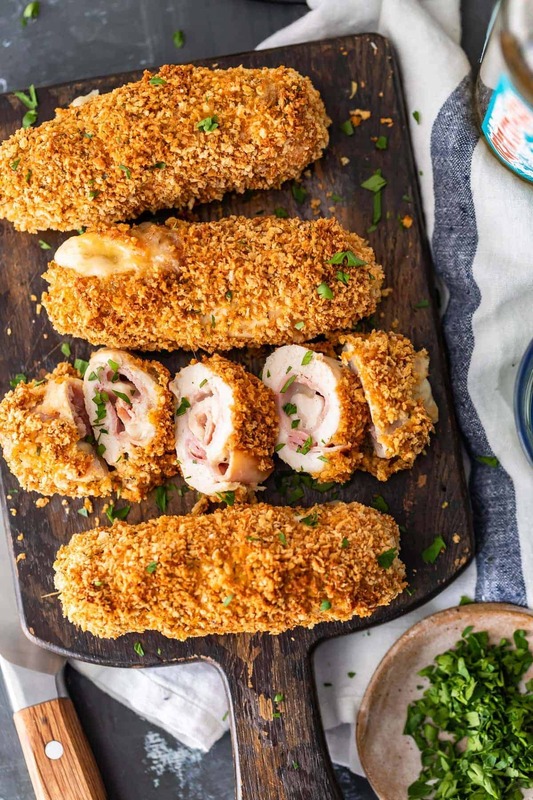 Roll and gently press a chicken breast in the panko breadcrumbs. Dip and roll the breast in the beaten eggs. Once again, roll the breast in the breadcrumbs being careful to cover any bare spots. Place the breaded breast on the rack-covered baking sheet. Repeat with all breasts. The breasts can be cooked immediately, or they can be refrigerated (uncovered) up to an hour to allow the coating to dry out a little. I think it works best to let them dry a little in the fridge, but it isn’t necessary. Cook the breast at 375°F for 30-40 minutes. Spin the sheet pan around after 15 minutes. The chicken is done when golden brown and the internal temperature registers 160°F on a meat thermometer. While the chicken cooks, make the sauce. Add 2 tablespoons flour and whisk until smooth. Cook the butter/flour mixture until it becomes a little darker, 1-2 minutes. While whisking, add wine and continue whisking until smooth. Continue whisking and add chicken broth and cream. Add mustard and thyme. Whisk until smooth. Season to taste with kosher salt & black pepper. Bring the mixture to a boil, reduce the heat and cook just until sauce thickens to almost-gravy consistency. Remove from the heat and set aside. When the chicken is almost ready, reheat the sauce over low heat to serve with the chicken. This recipe was contributed by Susie from Simply Sated. Be sure to check out her site! 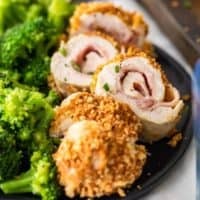 My family loves chicken cordon bleu, but I’ve never made it with a sauce! Your recipe looks phenomenal! This comes out perfect every time! My husband’s favorite meal. This chicken recipe was a winner. Everyone in the family loved it. Thanks for sharing. Made this for dinner last night and it was a huge hit! Can’t wait to make it again! 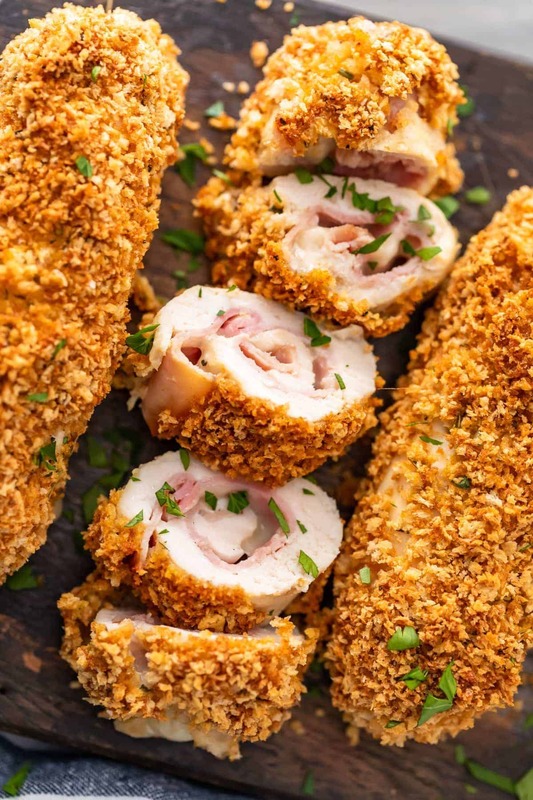 Oh we love chicken cordon bleu! It is a favorite! Can’t wait to try this. Another dinner hit! this was fabulous. 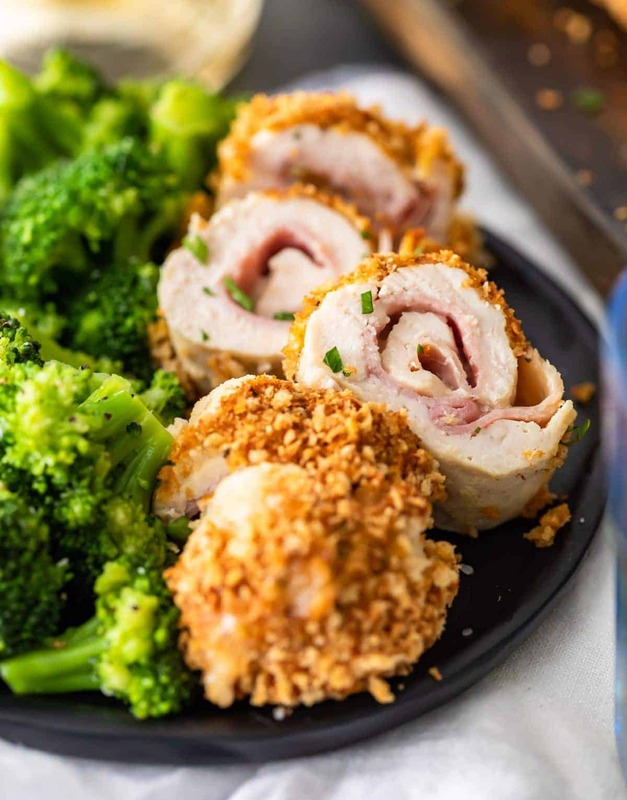 The dijon cream sauce is the perfect accompaniment to this Chicken Cordon Bleu. Thanks! AGREE! I love it so much. 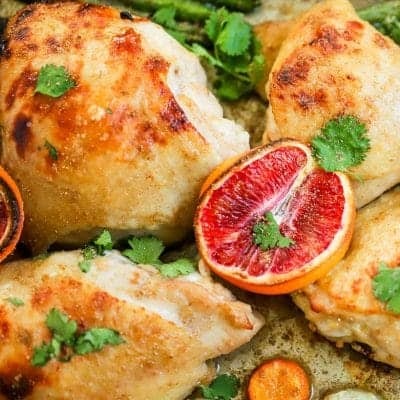 You can never have too many great chicken recipes! Thanks for the fabulous recipe! This was a huge hit at my house! Can’t wait to make it again! The best chicken cordon bleu I have ever had! So easy to make and great for a weekenight dinner! The kids loved this one, too. That’s the best, thank you!